As part of the infrastructure of the distributed, multi-process, multi-threaded system that my team is developing, a parameterized, mutex protected, inter-thread message queue class has been written and dropped into a general purpose library. To unburden application component developers from having to do it, the library-based queue class manages a reusable pool of message buffers that functionally “flow” from one thread to the next. So far, so good, right? I thought so too – at the beginning of the project. But as I’ve moved forward during the development of my application component, I’ve been experiencing a growing and persistent discomfort. D’oh! Using the figure below, I’m gonna share the cause of my “inner thread” discomfort with you. For small messages and/or when the messages are of different types, I don’t see much wrong with this inter-thread message passing approach. However, when the messages are big and of the same type, my discomfort surfaces. In this case (as we shall see), the “utilize” bullet amounts to an unnecessary copy. The more “inner” threads there are in the pipeline, the more performance degradation there is from unnecessary copies. So, how can the copies be eliminated and system performance increased? One way, as the figure below shows, is to move message buffer management responsibility out of the local queue class and into a global, shared message pool class. The key to avoiding unessential inner thread copies is that the messages must be intentionally designed to be of the same type. As soon as I get some schedule breathing room (which may be never), I’m gonna refactor my application infrastructure design and rewrite the code to implement the memoryless queue + global message pool approach. 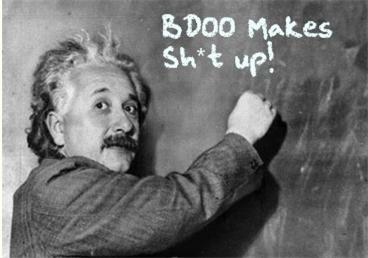 That is, unless someone points out a fatal flaw in my reasoning and/or presents a superior inter-thread message communication pattern. Recently, I had to publicly disclose the design of the multi-threaded CSCI (Computer Software Configuration Item) that I’m currently bringing to life with a small group of colleagues. The figure below shows the entities (packages, CSCs (Computer Software Components), Classes) and the inter-entity relationship schema that I used to create the CSCI design artifacts. As the figure illustrates, the emerging CSCI contains M packages and K top level CSCs . Each package contains from 1 to N 2nd level CSCs that associate with each other via the “communicates” (via messages) relationship. 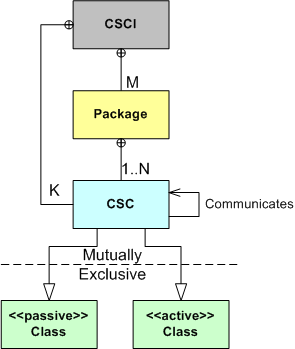 Each CSC is of the “passive” or “active” class type, where “active” means that the CSC executes within its own thread of control. Like any “real” design effort (and unlike the standard sequential design-code-test mindset of “authorities“), I covertly used the incremental and iterative PAYGO methodology (design-a-little, code-a-little, test-a-little, document-a-little) in various mini sequences that, shhhh – don’t tell any rational thinker, just “felt right” in the moment. As we speak, the effort is still underway and, of course, the software is 90% done. Whoo Hoo! Only 10 more percent to go. 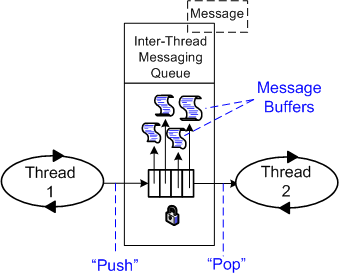 When the asynchronously executing threads in a multi-threaded application process need to communicate with each other using same-address-space messages, a thread-safe way of providing a message passing service is required. The figure below shows a black, um, yellow box model of the functionality that needs to be designed, coded, and tested for solving the problem. The little ovals with arrow thingies on them represent asynchronously executing threads of code either on the same cpu or on separate cpus. The little lock thingy represents a mutex that protects the mechanism internals from data corruption via simultaneous, uncontrolled access by more than one thread (I hate when that happens!). 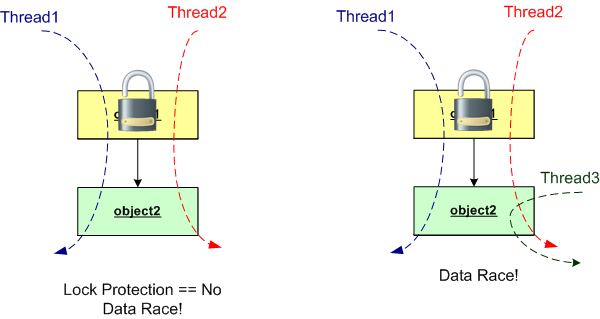 There are at least two ways to implement a thread-safe, inter-thread message passing service; by passing copies of the message objects themselves or by passing (smaller) pointers to message objects. 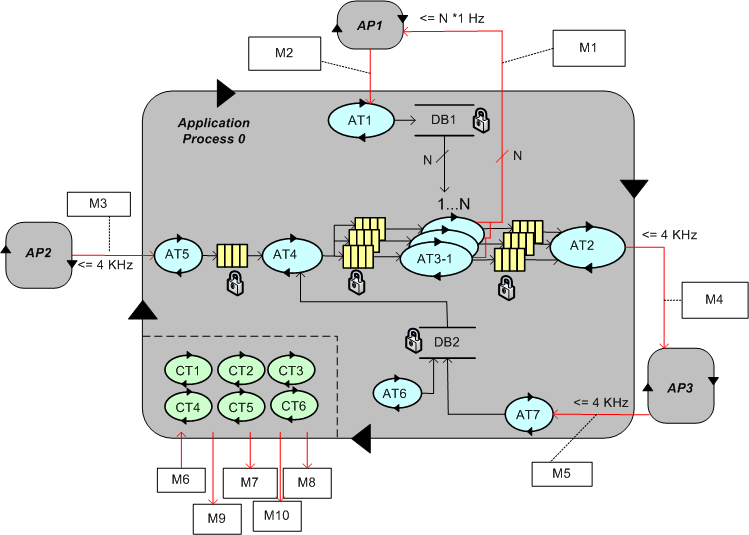 As the figures in the models below illustrate, the design and user API for the pass-by-objects approach is simpler than the pass-by-pointers approach. 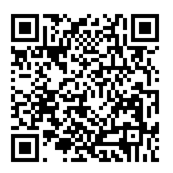 The tradeoff is that the performance of the pass-by-objects approach degrades as the message size gets larger. In addition, passing by pointer allows dynamic polymorphism to be utilized. Since, in option 2, the memory that holds the message content is managed by the mutex-protected message passing mechanism and not shared by the clients themselves, the clients must acquire a pointer to a message memory buffer before either filling (writer) or processing (reader) the payload. Thus, the mutex must be locked/unlocked twice; once to “pop” the pointer and a second time to “push” the pointer. 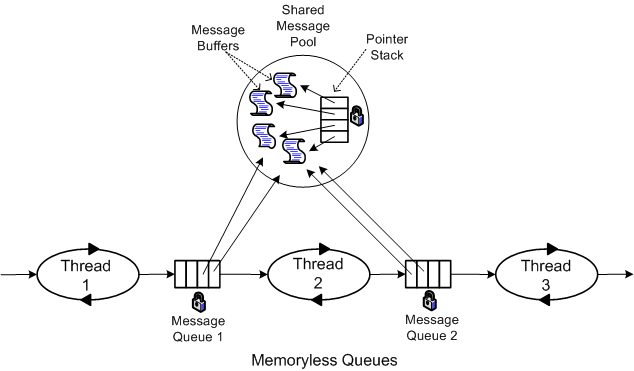 An alternative to the double queue design in option 2 is to require the clients to manage the message buffers themselves via the aid of a memory pool. The disadvantage of pushing the message memory management out of the queuing mechanism and up into the application layer is that it introduces a long distance coupling between the Writer and Reader – which may be written by different people. If the reader programmer forgets to release a pointer back to the pool after processing a message, a memory leak will occur (I hate when that happens!). By encapsulating the lock/unlock actions within the message passing mechanism written by one person, the chances of introducing a memory leak are reduced and the reader and writer threads remain decoupled. A third inter-thread message passing design option is to employ a (much trickier to implement) lockless mechanism. Better yet, the use of a programming language that natively supports inter-thread message passing under the covers unburdens application programmers with the subtleties of inter-thread synchronization. 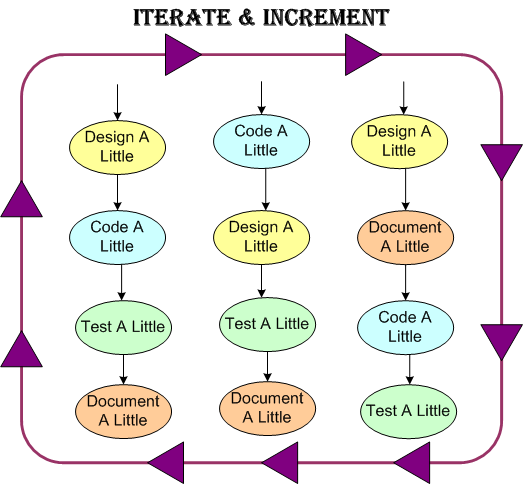 Tasks, threads, and processes. What’s the difference between them? Most, if not all Real-Time Operating Systems (RTOS) are intended to run stand-alone applications that require small memory footprints and low latency responsiveness to external events. They’re designed around the concept of a single, unified, system-wide memory address space that is shared among a set of prioritized application “tasks” that execute under the control of the RTOS. Context switching between tasks is fast in that no Memory Management Unit (MMU) hardware control registers need to be saved and retrieved to implement each switch. The trade-off for this increased speed is that when a single task crashes (divide by zero, or bus error, or illegal instruction, anyone? ), the whole application gets hosed. It’s reboot city. Modern desktop and server operating systems are intended for running multiple, totally independent, applications for multiple users. Thus, they divide the system memory space into separate “process” spaces so that when one process crashes, the remaining processes are unaffected. Hardware support in the form of an MMU is required to pull off process isolation and independence. The trade-off for this increased reliability is slower context switching times and responsiveness. The figure below graphically summarizes what the text descriptions above have attempted to communicate. All modern, multi-process operating systems (e.g. Linux, Unix, Solaris, Windows) also support multi-threading within a process. 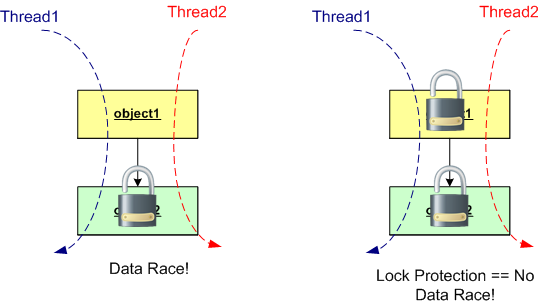 A thread is the equivalent of an RTOS task in that if a thread crashes, the application process within which it is running can come tumbling down. Threads provide the option for increased modularity and separation of concerns within a process at the expense of another layer of context switching (beyond the layer of process-to-process context switching) and further decreased responsiveness.